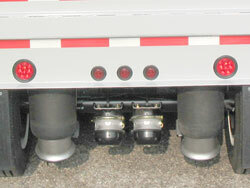 Air and light line extensions are added to the rear of a trailer so that a removable axle can be used. When the trailer is traveling empty, the axle airlift saves tire wear and improves fuel efficiency by lifting the axle 3'' to 4'' off the ground. 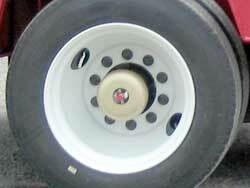 An airlift is usually installed on the last axle. When the trailer is traveling empty, the air lift axle saves tire wear and improves fuel efficiency by lifting an axle 3'' to 4'' off the ground. 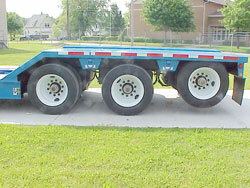 An air lift is usually installed on the last axle. An air ride suspension provides a smoother ride while allowing the rear frame to be adjusted ±3'' from the standard ride position. 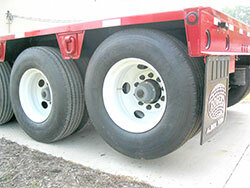 Aluminum disc wheels 22.5 x 8.25 10-hole, hub-piloted are available for 35-ton trailers. 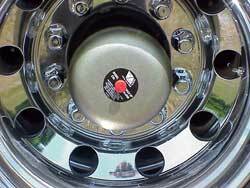 Aluminum disc wheels 17.5 x 6.75 8-hole, hub-piloted are available for 25-ton trailers. 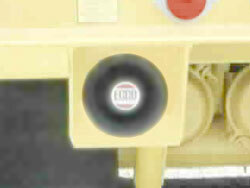 The mechanical backup alarm is attached to the hub of a curbside wheel and automatically sounds when the wheel moves backward. Bar grating can be installed underneath cross members in the center of the deck. It creates a self-cleaning area to hold chains, binders and blocks. 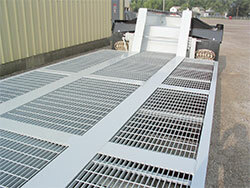 Bar grating for better footing traction is used on the deck of trailers where transformers or other machines are permanently anchored to the trailer frame. 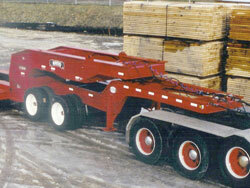 A 36'' long rear extension with a 14° angled slope aides in loading machines over the rear frame of the trailer. 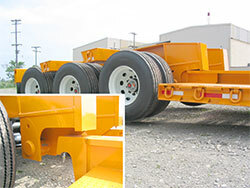 A booster axle assembly connects the rear frame to trailing removable axle(s). 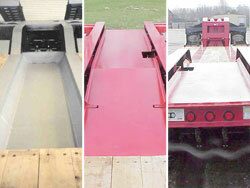 Available in spread lengths of 10'-1'' (Top photo, single axle), 12'-1'' and 14'-1'' (Bottom photo, tandem axle). 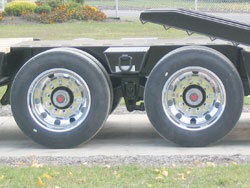 Available axle combinations: 2+1, 2+2, 3+1, 3+2 and 3+3. 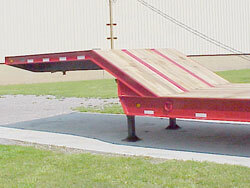 This style of ramp, on a drop side deck frame, makes it easier to load large-tired equipment over the rear frame. 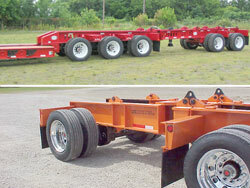 The last (3) cross members of the main frame can be notched to create a ''bucket pocket'' for a large excavator to ride lower on the trailer. A bottom plate or bar grating may be added underneath for storage. 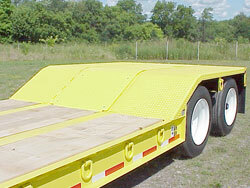 Loose center boards, secured with spring hold-downs, can be removed and placed on the swinging side brackets for temporary additional trailer width. 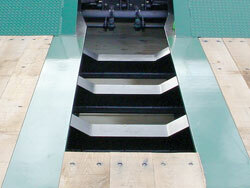 Cover boards in the center of the rear frame provide traction for rollers and can be removed for access to a boom trough. The reinforced center cover plate is bolted in and can be removed for access to a boom trough in the rear frame. 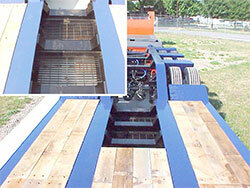 It can also be permanently welded in place, if a boom trough is not needed. Recessed cover plates can be welded or bolted in place in the center area of the deck or rear frame to meet the customer's preferences for storage space and road spray protection. 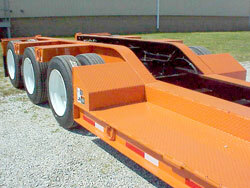 The detachable rear frame is part of a modular trailer package where different deck styles and sizes can be interchanged for maximum load-hauling utility. ROGERS® uses a simple hook and shaft connection method that eliminates the need for bolts and nuts. 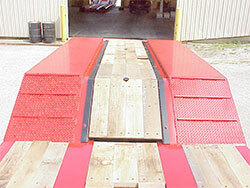 Dock bumpers protect the rear channel and lights from damage when using a loading dock. A helper dolly distributes a trailer's king pin load between the trailer and the tractor. 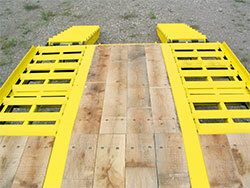 The helper dolly is made shorter than a jeep dolly for easier maneuverability. 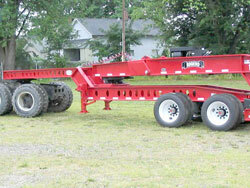 A jeep dolly helps to distribute a trailer's king pin load between the trailer and tractor. 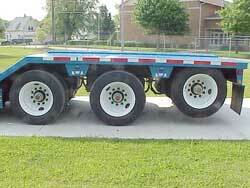 The fifth wheel of the dolly and the tractor are the same height. 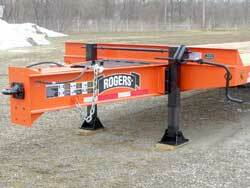 The jeep dolly is used in States that require longer ''bridges'' to meet weight laws. 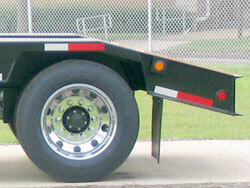 Full width gooseneck offers the most trailer for your money. 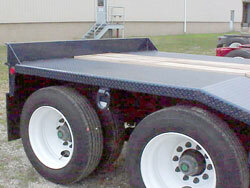 Load nearly anything over the low profile gooseneck. 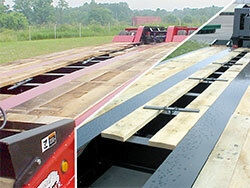 Overall gooseneck length starts at 11'-7'' with a 30° slope and is covered with oak decking. 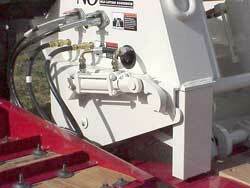 Non-load bearing gooseneck fenders provide road spray suppression for the tractor. 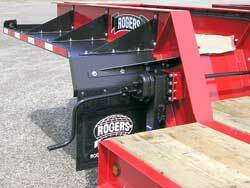 The fenders come complete with clearance lights in the front corners and ROGERS® logo mud flaps. The bolt-on design permits field installation. 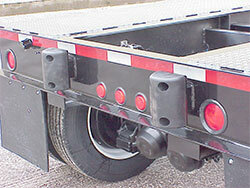 These are available for most fixed gooseneck models.